Historic homes for the perfect getaway. The Stathopoulos House: Smack Dab in the Middle of Savannah’s Historic District! 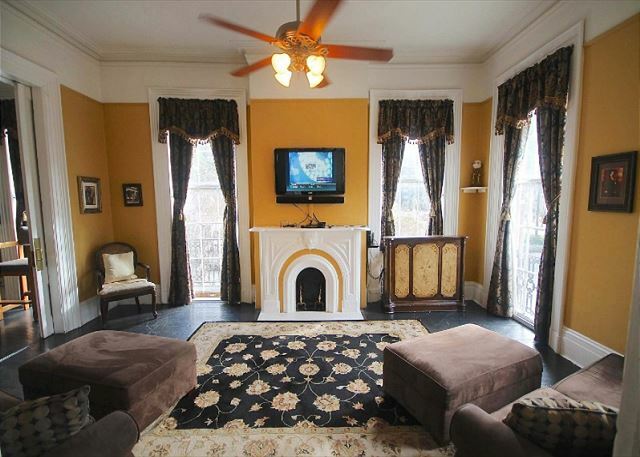 Historic Savannah vacation rentals are what Savannah Dream Vacations specializes in, which I already knew. But when I found out about the “newest” addition to their collection of homes, the Stathopoulos House, I couldn’t wait to see it! The Huntingdon House: Balconies and Private Courtyards in Historic Savannah! The property has been totally renovated, and has so many inviting places in the interior! Cook Thanksgiving Dinner in a Dream Kitchen! If your kitchen is cramped, or your house is low on space, cooking at home can be a real pain. Book a luxury vacation home with Savannah Dream Vacations, and you can get the whole family together in a historic Savannah home with a modern fully-equipped kitchen! Chandler House: Rare New Construction Historic Vacation Rental. Not everybody likes old houses. Sure, people like the style and charm of an old house, but 120+ year old properties, renovated, or not, just aren’t for everybody. So when Savannah Dream Vacations gave me the opportunity to stay in the Chandler House, I was excited, but not sure what to expect. Best Savannah Vacation Rental on River Street. One of Savannah’s best features is our squares, but Forsyth Park is one of the city’s crown jewels: shaded, beautiful, and or course, packed with history! Savannah’s version of “Central Park” is a great place to throw a frisbee with the dogs or kids, have a picnic, or tie up your hammocks to the shaded oaks and relax. Here are some things to check out in the park during your next trip to Savannah.